A modern and well presented three storey town house situated in this popular residential development, just off the A46 and South of the City of Lincoln. The property offers spacious and flexible living accommodation to briefly comprise of Ground Floor Entrance Hallway, Utility Room, Bedroom 3 with Jack and Jill Shower Room (also accessed from the Hallway) and Sitting Room/Bedroom 4. First Floor Landing leading to the Breakfast Kitchen and Lounge Diner. Second Floor Landing leading to Master Bedroom with En-Suite Shower Room, Bedroom 2 and Family Bathroom. Outside the property benefits from a Single Garage and allocated parking space, as well as a lawned garden to the rear with decking. Viewing of the property is highly recommended. LOCATION Witham St Hughs is situated between Newark and Lincoln, both of which provide excellent shopping, bars, restaurants and leisure facilities. Local village primary schooling is available and secondary schooling is available in nearby North Hykeham. The village offers a local Co-op Store, village hall, takeaways, hairdresser, veterinary clinic and coffee bar. Lincoln, North Hykeham Newark are easily accessible via the A46. ENTRANCE HALLWAY With double glazed external door to front elevation, storage cupboard, stairs to the First Floor Landing, under stairs storage cupboard, two radiators and doors leading to Bedroom 3, Jack and Jill Shower Room, Sitting Room/Bedroom 4 and Utility Room. UTILITY ROOM 6′ 4" x 6′ 2" (1.93m x 1.88m) With double glazed external door to rear elevation, wall unit, base unit with work surface over and tiled splash-back, wash hand basin, spaces and plumbing for washing machine and tumble dryer, wall mounted gas fired central heating boiler, radiator and extractor fan. BEDROOM 3 10′ 0" x 9′ 6" (3.05m x 2.9m) With uPVC double glazed window to front elevation, radiator, laminate flooring, built-in wardrobe and door to the Jack and Jill Shower Room. JACK AND JILL SHOWER ROOM With suite to comprise of low level WC, wash hand basin and walk-in shower cubicle, partly tiled walls, radiator and extractor fan. 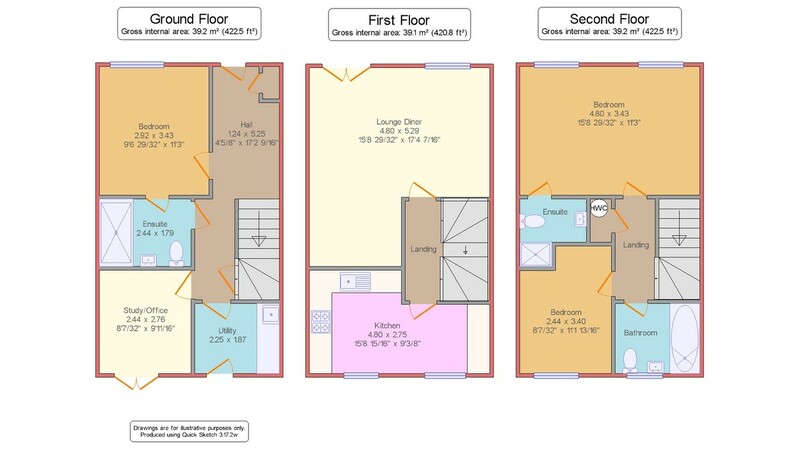 SITTING ROOM / BEDROOM 4 9′ 9" x 9′ 1" (2.97m x 2.77m) With uPVC double glazed double doors to rear elevation and radiator. FIRST FLOOR LANDING With stairs to the Second Floor Landing, banister rail, radiator and doors leading to the Breakfast Kitchen and Lounge Diner. BREAKFAST KITCHEN 16′ 1" (max) x 9′ 9" (max) (4.9m x 2.97m) With two uPVC double glazed windows to rear elevation, fitted with a range of wall, base units and drawers with work surfaces over and tiled splash-backs, 1 1/2 bowl stainless steel sink unit and drainer with mixer tap, integral double oven four ring AEG gas hob with extractor fan over, space for a fridge freezer, plumbing and space for a dishwasher, breakfast bar and radiator. LOUNGE / DINER 16′ 3" (max) x 16′ 2" (max) (4.95m x 4.93m) With uPVC double glazed window to the front elevation, uPVC double glazed doors opening to a Juliette Balcony, laminate flooring and two radiators. SECOND FLOOR LANDING With access to the roof void, banister rail, radiator and doors leading to two Bedrooms, Family Bathroom and airing cupboard housing the hot water cylinder. EN-SUITE SHOWER ROOM With suite to comprise of low level WC, wash hand basin, walk-in shower cubicle, partly tiled walls, heated towel rail and extractor fan. BEDROOM 2 9′ 4" x 8′ 5" (2.84m x 2.57m) With uPVC double glazed window to rear elevation, built-in wardrobe and radiator. FAMILY BATHROOM With uPVC double glazed window to rear elevation, suite to comprise of low level WC, wash hand basin and bath, partly tiled walls, radiator and extractor fan. OUTSIDE To the front of the property there is a small lawned garden. To the rear of the property there is a decked seating area with raised planters, lawned garden and a garden shed. There is gated access to the rear leading to the parking area with an allocated parking space and a Single Garage in a block. SINGLE GARAGE AND ALLOCATED PARKING Are accessed off Moor Hen Close.